These prerequisites assume you're working on a 64bit Windows 10 operating system machine. Since dev.to codebase is using Ruby on Rails framework, we will need to install Windows Subsystem for Linux. Some dependencies used by the source code triggered errors when installing on Windows, so using WSL allows you to work on the software and not fixing gem incompatibilities. First, let's enable Windows Subsystem for Linux in your machine. You can do this by opening Control Panel, going to Programs, and then clicking "Turn Windows Features On or Off". 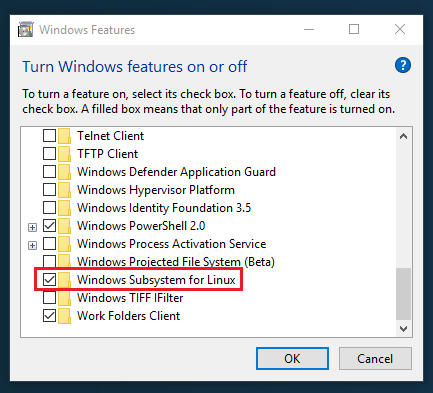 Looking for the "Windows Subsystem for Linux" option and check the box next to it. Windows will ask for a reboot. Once you've got this installed and after rebooting, follow this link to install Ubuntu 18.04 on Windows. On your first run, the system will ask for username and password. Take note of both since it will be used for sudo commands. If npm -v gives Syntax error: word unexpected (expecting "in"), restart the terminal and try again. If you don't have PostgreSQL installed on your Windows system, You can do so here. WSL is able to connect to Windows Postgresql. Pay attention to the username and password you setup during installation of Postgres as you will use this to configure your Rails applications to login to Postgres later. There is a possibility that you might encounter a statement timeout when seeding the database for the first time. Please comment out the variable statement_timeout from database.yml if it happens.